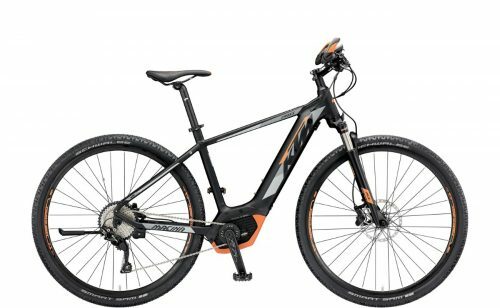 The Macina Cross 10 CX5 is in most respects, a very similar ebike to its stable mate, the Sport. The Cross however is the lighter, more simple version of the two, and with similar levels of components. Long gone are the days when electric bikes looked clunky and ugly! The KTM Macina Cross 10 CX5 has looks to die for! A true sports utility vehicle. Great for commuting, or leisure riding, the Cross 10 CX5 takes in forest trails, canal paths or the less than smooth UK road network with ease. Those climbs, and accelerations away from tricky junctions aren’t a problem as power delivery is via the very powerful 75Nm Bosch CX drive system. Battery capacity is huge. The 500Wh Bosch PowerTube unit ensures extensive range for even the longest journey. The Macina Cross 10 CX5 comes equipped with a fine 10-speed Shimano Deore derailleur with rapid fire shifters. Changing gear is effortless and precise, just when needed. Suspension is via a pair of Suntour forks that cope admirably with all those bumps and hollows. The ride is ultra comfortable, yet sporty. Designed with the rigours of day to day use, the Cross has a full sized 28″ wheel for efficiency. The Intuvia display with walk assist function is mounted unobtrusively, centrally on the bars, providing all rider information. Functionality is accessed via a simple thumb button cluster to the left on the bars. Schwalbe Smart Sam tyres are the perfect all-round solution for tarmac, rough and even loose terrain. Ideal for canal tow paths, railway cuttings too. The Cross 10 CX5 is indeed an extremely comfortable ride, with a very sporty feel at the same time. The lightweight nature and agility of the Macina Cross 10 CX5 make this e-bike a very desirable and worthy performer. It’s a no-fuss, simple solution for getting out and about.